When fall comes to the San Juans, we always get a call from Caroline Sando, a Jemez potter that we have had the pleasure to work with for over two decades. “Are you ready for your Nativity sets?” she’ll ask. Caroline started making pottery at the age of 7, “with the help of my parents.” When she got out of high school, she became a full time potter. “I’ve been an artist for 28 years,” she says. Caroline regularly sells out at the Santa Fe Indian Market and works with many of the best Native Arts galleries in the country. Her work just continues to get better. 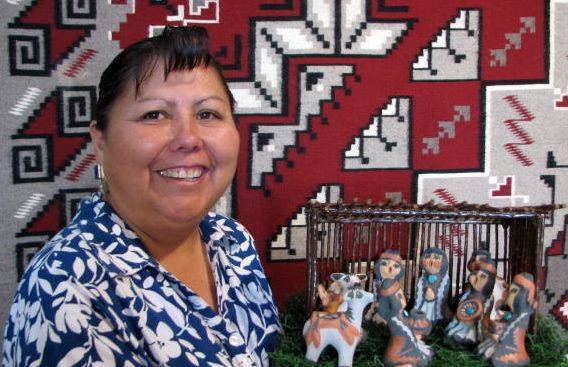 The personality in her figures and the care she takes in doing their clothing sets her apart from other potters.In fact, the Cathedral in Santa Fe displays one of her Nativity sets during the Holiday season.